Bet on your favourite player to score in tonight’s anticipated match with William Hill’s Europa League Final Offer! 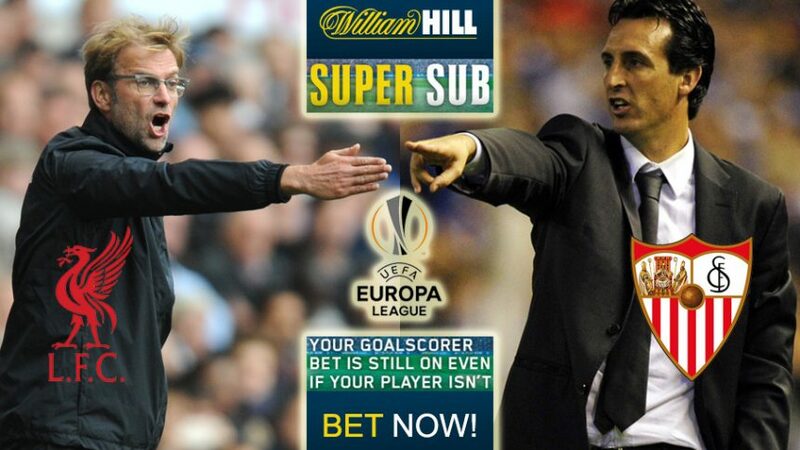 Online sportsbook William Hill offers a special promo “Super Sub” for tonight’s clash between Liverpool and Sevilla. The Europa League Final Offer will insure your goalscorer bet remains active despite your favourite player being substituted during the game. We’ve all seen this happen tons of times: you place a wager on a player to score during a match, but then suddenly he gets injured and is substituted, or the manager decides to pull him off for no reason. But the Europa League Final Offer makes sure you don’t lose this bet. So when your favourite player is taken off the pitch, the bet will automatically be transferred onto the new player that replaced him and the odds will remain at the original price. That way you don’t lose anything. For instance, if you bet on Daniel Sturridge to score at “Anytime” 2.45 (29/20) in tonight’s game, and he is substituted for some reason with Divock Origi 3.00 (2/1), then your bet will still count as the original wager that you’ve placed on Sturridge 2.45 (29/20). Some of the other Liverpool candidates to find the back of the net at “Anytime” are: Christian Benteke 2.80 (9/5), Philippe Coutinho 3.30 (23/10), Roberto Firmino 3.30 (23/10), Adam Lallana 4.00 (3/1) and James Milner 5.00 (4/1) among others. Use the Europa League Final Offer to insure your goalscorer bets. Sevilla also boast an impressive attack that can strike a goal at any moment during the match. Bet with Europa League Final Offer by placing bets on “Anytime Goalscorers” on some of the following players from the Spanish side: Kevin Gameiro 2.40 (7/5), Fernanado Llorente 2.90 (19/10), Juan Munoz 3.50 (5/2), Ever Banega 4.00 (3/1) and Evgan Konoplyanka 4.00 (3/1). Place a wager on the Goalscorers market with the online sportsbook and don’t forget to use the Europa League Final Offer to protect your bets! Bet on your favourite player to score with Europa League Final Offer!